Travellers through Newcastle International Airport can try shopping in a futuristic shop. This passenger was left disappointed. Newcastle International airport had a facelift in the summer. Among the changes, a futuristic store quietly moved in. The Xpress PodShop is a bright space located in the main shopping area. Unlike the other airport shops there are no shop assistants and no physical products on display. After a few moments wandering around the small store it dawns on you that Xpress PodShop is a large vending machine. The concept is excellent. Travellers select what they want to buy, pay by credit card and then collect their goods. I adore technology and was really excited when first saw the store. I've read about similar projects in Japan and Korea. I really wanted it to be amazing. Unfortunately Xpress PodShop's execution lets it down. It doesn't really work. Not for me anyway. Xpress PodShop could be a brilliant solution for the last minute on-the-move airport purchases that characterise modern travel. When I'm traveling through an airport, either alone or with family, I'm usually in the market for toothpaste and toothbrushes; power adapters; phone chargers; headphones; water; magazines; and books. I'd willingly dodge the browsing public and queues at other stores to buy these items. Instead Xpress PodShop sells golfing products, sweets, fancy popcorn and other high end snacks, children's toys and consumer technology products. Portugal and Spain may be popular destinations for golfing holidays from Newcastle but I've never bought golfing kit in an airport. A series of screens and backlit images shows the products on display. You intuitively expect these to be touch screens. You need to select and pay for your purchases at an adjacent cashpoint-like terminal. I've stood by the store on three occasions since it opened, each for ten minutes. I've never seen anyone buy anything. When I visited the store today one of the three terminals, selling children's toys and consumer technology, was blank and lifeless. Xpress PodShop offers a phone number for disappointed shoppers to call. Robots are good at handling labour intensive and repetitive tasks but the interface and workflow between human and machine is tricky. The self-service checkouts in supermarkets demonstrate the challenge. I've yet to use one without falling out with the finely tuned machine. Ironically, most stores now employ someone to run between the machines helping shoppers. The robotic store isn't a new concept, far from it. So called-out Automats originate from self-service restaurants in 1900s Berlin. The format declined with the arrival of fast food. Wikipedia tells the story of more recent projects in the Netherlands, Japan and Spain. 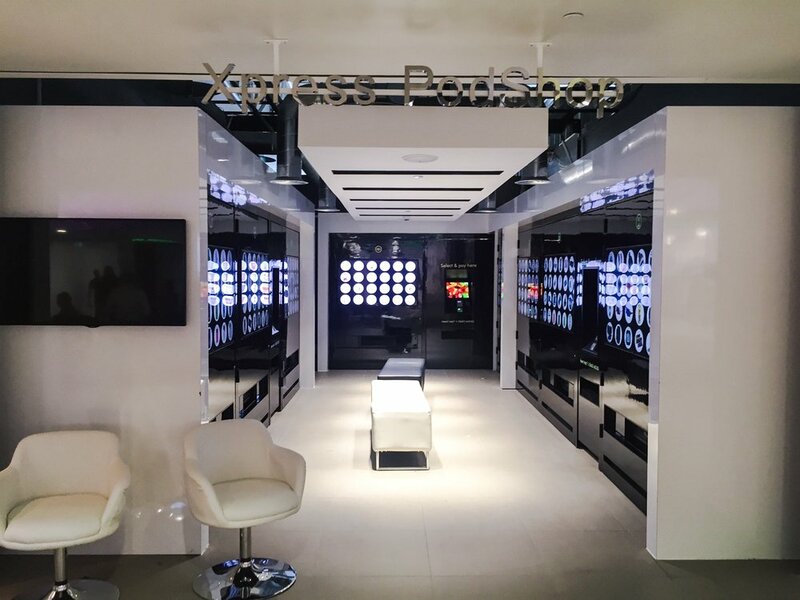 Xpress PodShop joins a rich history of retail pioneers that have tried to reinvent and automate the shopping experience. There's no doubt that it has potential. Newcastle is a moderately busy international airport with significant footfall. But there's work still to be done on the product mix and interface. I'd love to hear from the company behind project about how it has been received.